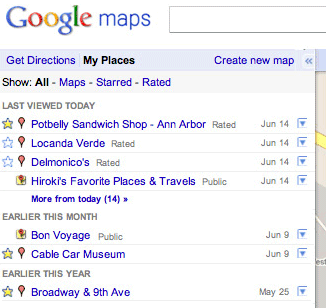 Google Maps updated the "My Maps" section, which now includes the places you've starred and rated. Mapplets are no longer available and custom maps aren't popular enough to have their own section, so "My Maps" became "My Places", a list of locations you've visited, bookmarked, rated or saved to a custom map. "Items are organized by date with your most recent activity at the top, and filters make it easy to sort and view only your maps, starred locations or rated places. My Places also simplifies your ability to manage the locations that make up your personalized maps experience. Using the drop-down arrow next to each location in your list, you can easily delete any of your saved maps, stars or Google Places ratings. These personalization changes will automatically be synchronized across all other Google properties including Google Places, Google Maps, and Google Maps for mobile," informs Google. I wouldn't be surprised to see that the list of Google Latitude check-ins is added to My Places and that the combined list becomes an optional tab on your Google Profile. Hope GM team fix this soon. ...By date? Hmm, that's kind of useless, since you can't add tags/folders to any of the results. I have a "My Map" that I use to plot all of the locations of our business. In the past, I'd simply add the address and save it to the map and it would appear as an icon on the map AND in the list on the left-hand side. It seems that it no longer appears on the left-hand side menu. Is this a known problem or is it me? I went to work on prepare a custom map yesterday and uggh! what a struggle. My routes would not save. "Save to My Maps" would not appear but I persisted for hours and managed to cobble something together. I could not finish the project. Wow. They've really messed up Google Maps. It won't let me route to minor (dirt) roads anymore, unless I switch to Walking mode. This would be fine, except when in Walking mode it won't allow me to save the map. This "update" has changed Google Maps from an extremely useful tool to a complete waste of time. Guess I'll have to buy Garmin mapping software. Bad marketing move Google. You're looking more and more like just another corporate giant every day. I used Google maps to find customers and route them into efficient sales routes. I can no longer save changes to the routes (add new customers and sequence them between old ones. That has made the my maps useless to me. Is there any way of saving the sequence of the places on the map? I cant save a place to my map. It just keeps saying saving in yellow but doesnt actually save. - you cannot link to a 'saved place' from Google Calender : ie if search does not find the address on a Calender entry, you are stuck, even if you save the place under your addresses! It should be SO simple to allow you to save a link to a map place in your Google Contacts and Calender! There is a way around. Google Maps allows you to store the Long. and Lat. Just make a table for cross reference and store the addresses for each of them. A cumbersome, however still useful way. I'm working on a project to make google mymap's creation much easier and straightforward. I'd love to hear feedback of people currently working with the MyMaps service and see what you'd like to see improved. I'm a big fan of Google MyMaps, but there's a lot of things that could be done better I believe. I have a very simple prototype, everything is built on top of google maps, it's simply creating a new and simpler UI. Does anyone know if it is possible and How to import an excel list of addresses into my places?